Charlotte Forten Grimké grew up in a rich intellectual and activist environment. 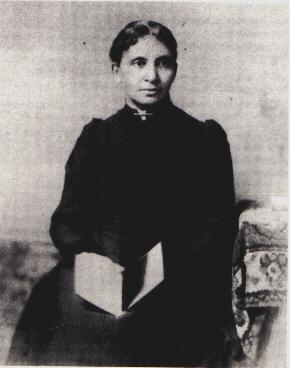 Born into a wealthy Black abolitionist family in Philadelphia, Pennsylvania, Charlotte Louise Forten became famous in her own right as a writer and poet. Her grandparents, James, Sr. and Charlotte Forten, hosted leading black and white abolitionists into their home on a regular basis. James Forten was one of the wealthiest blacks in Philadelphia, having amassed a fortune in the sail making business. Her parents, Robert Bridges Forten and Mary Woods Forten, continued the family’s activist tradition as had her uncles and aunts, including Sarah, Harriet, and Margaretta Forten, who helped establish the bi-racial Philadelphia Female Anti-Slavery Society. Charlotte spent much of her youth in Salem, Massachusetts. She attended the exclusively white Higginson Grammar School and then the Normal School. Like many educated women of her generation, Charlotte became a teacher. In 1856, she began teaching at the Epes School in Salem in order to support herself, but a bout with tuberculosis led her to return to her family in Philadelphia two years later. Like her aunt Sarah Forten, Charlotte also developed a passion for writing poetry, many of which focused on antislavery. During the Civil War, she wrote essays about her experience as a teacher among southern blacks. In 1862, she joined black and white northern women who journeyed to the Union-occupied coastal Sea Islands of South Carolina to teach formerly enslaved children. Forten later published “Life on the Sea Islands” in The Atlantic Monthly about her work with the Sea Islands Mission. The Fortens had maintained a long association with the abolitionist side of the Grimké family. In 1878, Charlotte Forten married Francis James Grimké, 13 years her junior. Born a slave, Grimké, was the half-brother of prominent white abolitionist sisters, Sarah and Angelina Grimké. After gaining his freedom once the war ended, Francis entered the Princeton Theological Seminary. Charlotte and Francis Grimké had one daughter who died in infancy. Charlotte also became more involved in missionary activities. They moved to Washington, D.C., where he served as pastor of the Fifteenth Street Presbyterian Church. She died in July 1914 in Washington, D.C.
Janice Sumler-Edmond, “Charlotte Forten Grimké,” in Darlene Clark Hine, ed., Black Women in America: An Historical Encyclopedia, vol. I (New York: Carlson, 1993): 505-507; Julie Winch, A Gentleman of Color: The Life of James Forten (New York: Oxford University Press, 2002); and Brenda Stevenson, ed., The Journals of Charlotte Forten Grimké (New York: Oxford University Press, 1988). Grimké (New York: Oxford University Press, 1988).